Full Time RVing - is it a Movement? Who is joining it and why? All indications are that there are more North American RVers moving into their RVs full time than ever before. Some are following a dream. For others, sadly, the decision is more out of necessity; they've lost their dream, in fact. And they can no longer afford a home base. Are retiring baby boomers opting for the full time RV life because it's a long time dream, or because they've had to abandon their original retirement dreams? Are younger RVers hitting the road because they're tired of the rat race or because they've exhausted other options? Often the lines are blurred between the intentional full time RVer and those who live in their RV full time by necessity. In both situations, RVing can be a creative solution and provide a good life for a few years at least. It's not usually a forever solution, but even a reluctant full timer may learn to embrace the lifestyle for several years. But what a huge decision! I know Randy and I don't plan to ever become full time RVers (at least not intentionally). We love our home-life equally as much as our travels and prefer to blend the two. But we totally understand the appeal it holds for others. I must admit that, anything that becomes a movement scares me a bit, though. I feel that too often people get caught up in someone else's dream. Randy and I spend 5 to 6 months at a time in our 19-foot 1990 Roadtrek. We could travel more often and can afford to replace our RV with a larger, newer one. But then we wouldn't be "doing it our way." Following your dream or someone else's? Watching the newly released documentary, RV Nomads - The Movie got me thinking about that. Anyone who has ever toyed with the idea of selling it all and hitting the road may be inspired enough by the movie to take the leap. The nomads interviewed in the movie have an amazing amount of combined experience and offer to share it on their individual web sites, blogs, videos, books, and podcasts. But to balance their romantic view, you should probably read a few bloggers who aren't promoting the lifestyle as much as they are just sharing what they discover. My web site is as guilty as any of making RVing seem affordable. But it isn't always true. One of the biggest factors is the investment in your new "home". Whether you borrow or pay cash for your RV, and no matter how well you maintain it, unlike a house, the value decreases every day. So it's easy to see how selling the house and putting that money into an RV can only have negative results. I know very few full time RVers who last more than 10 years before returning to a home base or moving on to new adventures. The average is probably closer to five years. Just something to keep in mind if you're financing your RV. There's an endless list of resources for learning how to make the transition to full time RVing. But I've yet to find any for transitioning back, planning for that day, and how to know when it's time. If you're a "used-to-be-nomad", I think there's a book or video series opportunity in there somewhere! 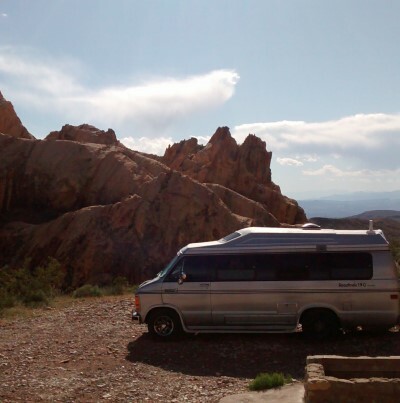 Have you purchased my guides for boondocking in southern Utah or Texas at any time in the past? If so, you should have received a link recently to download your free copy of the 2018 completely revised and updated editions. If you missed that email for any reason, please let me know so I can send it along. I’ll need to verify the name and email address you used when you made the purchase. Rachel is still working on the French versions of these guides; I’ll send those out as soon as they’re ready. What’s new at Boondockers Welcome? It was a year ago this week that we launched a new version of the web site with a completely revised platform. Since then, hosts no longer pay to join! This is paying off; we had roughly 1,000 host locations a year ago, but today we have well over 1,500. We currently see an average of 12 to 15 new hosts join per week. Hosts earn free guest privileges with every guest they welcome. But RVers who can’t host need to purchase an annual subscription. And that’s my perfect segue back to the subject of this newsletter. A good number of our hosts are considering RVing full time in the future. They’re paying it forward and accumulating free guest privilege rewards now, which they can bank until they travel. But they're also welcoming full time RVers to their property with the hope of learning from them - getting the story straight from the horse’s mouth - about what the nomadic RV lifestyle is really like. Is there an RVer on your Christmas List? Give them a one-year Boondockers Welcome guest subscription. If they're already members, this gift certificate can also be used to extend their existing subscription by a year. I’m a big fan of Chuck Woodbury. He’s been looking out for the rights of RVers for many years, standing up to opportunistic practices across the industry wherever he sees them. As well as publishing the number one weekly newsletter for RVers, RV Travel (now in it’s 18th year), he recently started two facebook groups that you absolutely need to join if you’re in the market to purchase an RV, whether new or used. Join RV Advice if you're in the market to buy an RV and want advice from other RVers about the make or model you're considering. The group RV Horror Stories is a gathering place for RVers to discuss serious defects with their RVs they are unable to get resolved. And, if it’s too late and you’ve already purchase a lemon, you can find a long list of resources that should help at rvtravel.com/fixit. Camper Chronicles: I mentioned them above but worth mentioning again. Lee and Tracy Perkins have been full-time RVers since November of 2015. I highly recommend their blog as the one to read/follow, if you're considering becoming full timers. Their posts are honest accounts that include their emotional challenges, detailed budgets, and experiences with various workamping positions. Full time RVing is not for everyone. I like following Maineiacs In Motion and other bloggers who, like us, manage to have the best of both worlds. Mike and Peggy take extended trips in their RV but keep a home base in Maine. Dave and Kathy Boland of Off Our Rocker RV sold their house in 2017 and moved into their RV full-time. So far, they've had no regrets and no second thoughts. They're doing most of it in our favorite style - "keeping it moving but doing it frugally" and provide a monthly financial report to show where the money went. Barney writes Old Fat Man Adventures He's an example of not having to go far from familiar stomping grounds to find new adventure. He moves between his favorite haunts in Texas and Alabama (places familiar to us, too, which is what attracted me to his blog). He calls his trailer his castle. His theme is "Don't wait, do it now" and every post is about something he has discovered that's "just too much fun". Mostly he just makes me smile. Wishing you happy holidays, safe travels, and amazing adventures!